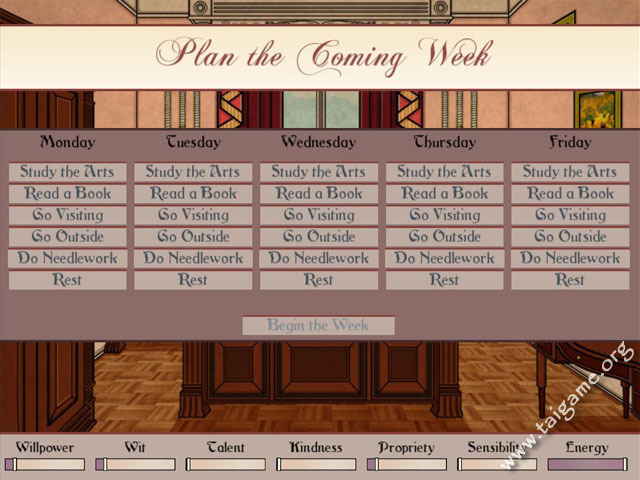 Although I’ve always thought it was a good idea to create a game about classic books, this was not what I had in mind. Which is not to say I didn’t enjoy it. I discovered this little game yesterday and admittedly played it for a few hours. It is basically based on Pride and Prejudice, Sense and Sensibility and Persuasion. Darcy, the Bingley sisters and Lizzy. First of all, you can choose your own name. You have two sisters (a red-headed Jane and Lydianne). They only use a few characters so some characters take on multiple roles. 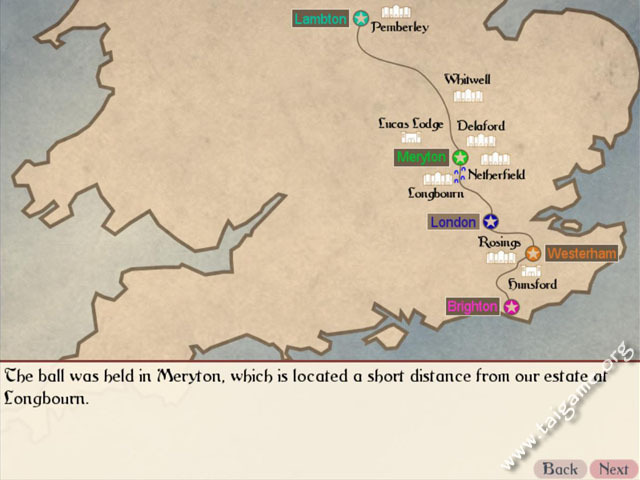 Lady Lucas in the game also takes you to the Lake District and also takes you to London (like Mrs. Jenkins), although the fall from Persuasion now takes place there instead of at Lyme. Your sister Lydianne falls and turns into Louisa but is nursed back to health by Brandon, thus ending up as Marianne. Mr Bennett, Jane and Mrs. Bennett. Mr. Wickham is now called Mr. Wickeby (he is a combination of Willoughly and Wickham) and Bingley is now called Edward instead of Charles. He’s supposed to be Edward Ferrars. 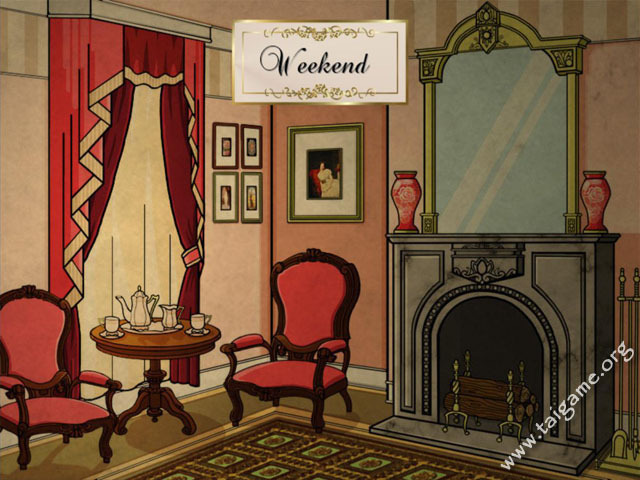 At the end up the Bingley plot, news circulates of him having wed Miss Darcy. This is however false. 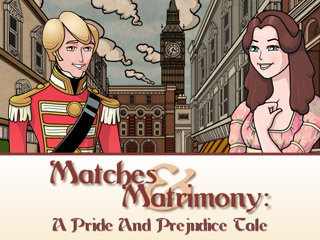 Instead, Mr. Darcy has married Caroline Bingley! 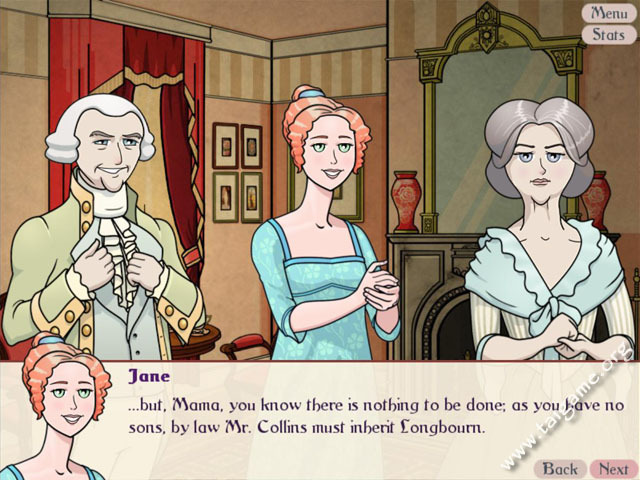 I really enjoyed having Colonel Brandon randomly show up after my character (in Marianne-mode) played at the piano. However, I didn’t care for his red hair and silly beard. I was also thrilled to see Captain Wentworth, who is a favourite Austen man of mine. He was dashing in his red uniform. The game is fun to play but a few things bothered me. 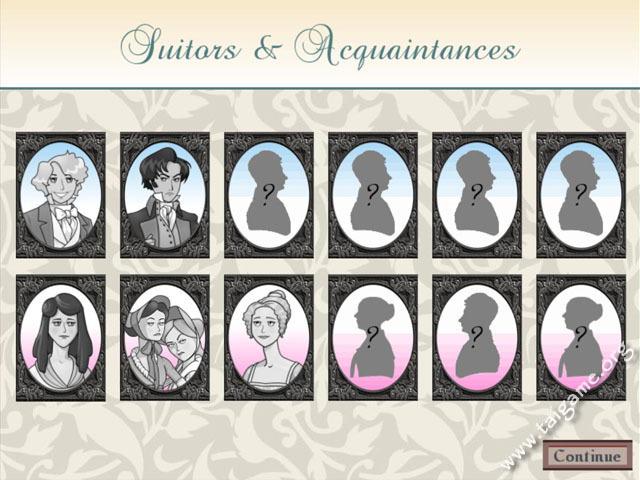 First of all, some of the characters did not look very Regency. 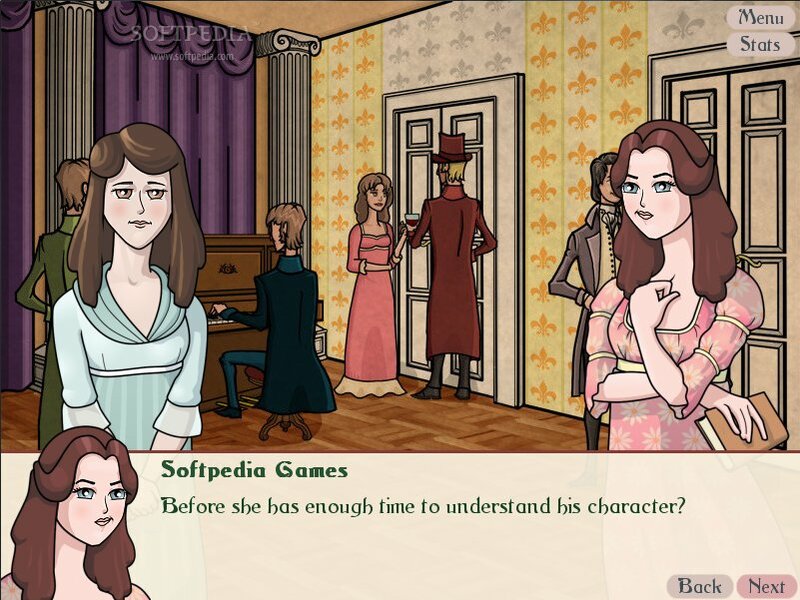 Some of them are walking around with their hair down and for some bizarre reason Mr. Bennett and Lady Catherine are dressed from a completely different period – and not from the Victorian era, although it is said that is the setting for the game. I also don’t like that the characters are wearing the same outfit throughout the game. It’s a period piece. I would have liked a mini-game to choose the most suitable outfit. 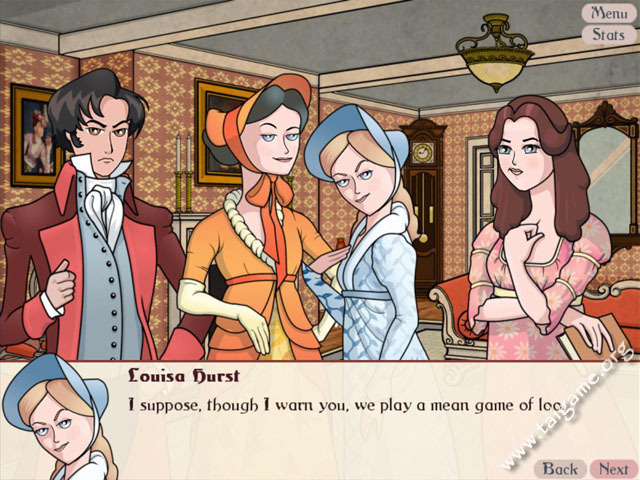 With Lady Catherine the Bourgh’s confrontation, I had too many Propriety points to disobey her and if you did not save the game recently, that basically means you’re screwed. There are 9 possible endings (one of which is Collins and another is not getting married). Once you finish the game once, you can request information on how to get a certain suitor and you have the option to ”get a head start” and fast-forward to chapter 10 with all the necessary attributes to get to that point. One of the things that amused me is that you can also end up with Bingley, in which case you have to get his sisters to like you. In this ending, Jane marries Colonel Brandon. Overall, I thought the dialogue also ran too long and I kept clicking to move on. Especially with verbose characters such as Collins and Mrs. Bennett, it went on and on. Maybe if you are not familiar with the story yet, this will interest you. But for someone who knows the dialogue inside out, it is not very interesting. Luckily, once you have gone through a certain dialogue once, you can skip it next time. 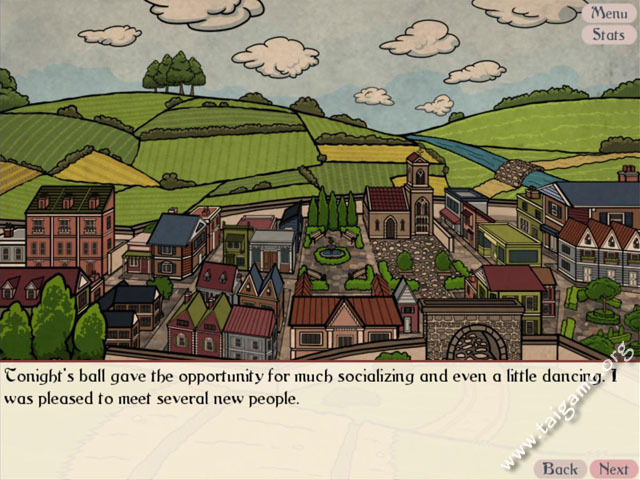 You progress through the story by selecting dialogue. The options you are presented with depend on your skills. A very kind person might say this but a very improper person might say that. What you say to the characters affects the storyline and it is worth saying that with Mr. Darcy, being difficult and stubborn is what gets him to like you. The first time, I agreed with him, danced with him straight away and as a result, he did not like me. How singular! So far, Wentworth is my favourite ending. That letter just gets me every time. If you’re stuck, there is a walk-through up on YouTube. You should check it out. I do find the narrator obnoxious, though.